Milk Protein Isolate, Calcium Caseinate (Milk), Cocoa Powder, Wheat Glutamine (Wheat/Gluten), Sodium Caseinate (Milk), Inulin, Chocolate Flavouring, Maltodextrin, Emulsifiers (Acacia Gum, Sunflower Lecithin), Sweetener (Sucralose), Alpha Amylase, Lactase, Cellulase, Protease, Lipase. Contain (or contains ingredient/ingredients derived from) Wheat/Gluten, Dairy and Soya. 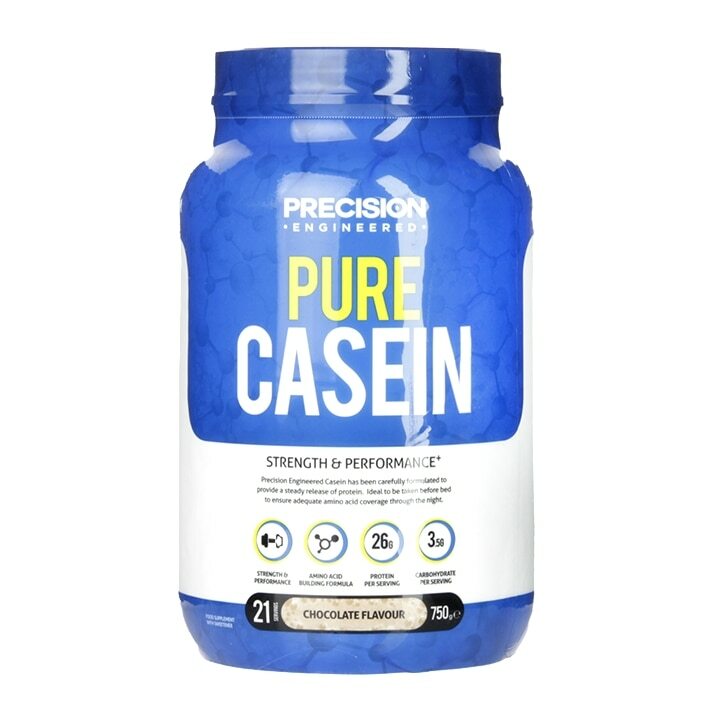 Precision Engineered Pure Casein Powder Chocolate Delight is rated 4.4 out of 5 by 9. Rated 4 out of 5 by Hamtzie from Tastes nice, dissolves reasonably well in water. Easy to drink. My problem was it gave me a really bad breath so for that reason I had to stop using it. Rated 4 out of 5 by Bodgeartist from Good quality Tastes nice.Quite a thick shake when mixed with water.I tend to use less powder than stated as it is quite thick.Ideal for evenings as it is a slow release protein. Rated 4 out of 5 by MG1878 from IMPRESSED As a hater of cottage cheese, being able to include Casein in my diet through the form of a powder works well. Often, I would have my routine glass of milk before bed but by simply mixing that volume of milk with this product offers a lot of benefits. The product is thicker than the Whey Protein supplied by the same company and I find that 1.5 scoops works best with 300ml of work. I would certainly recommend this product. The issue with the half-filled tub? H&B seem to have one tub size so this isn't an issue to me. You get what it says on the packaging.